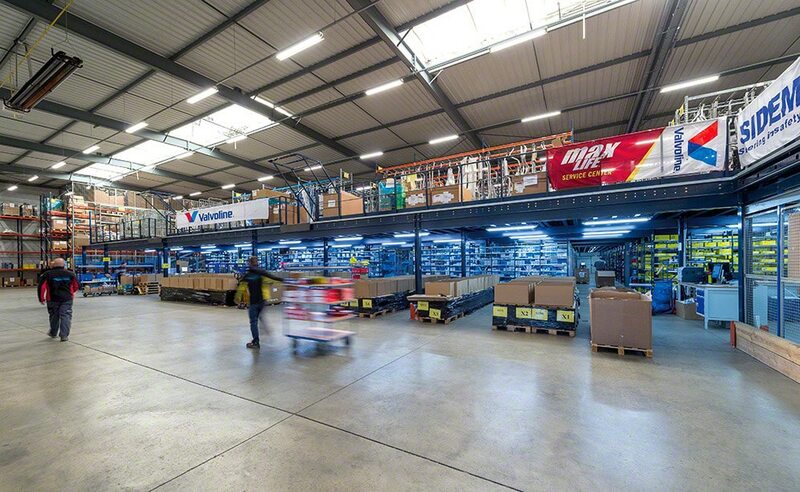 Van Heck Interpieces, an automotive spare parts distribution business, owns a 43,055 ft² warehouse on the outskirts of Lyon (France). There, all the storage systems have been supplied by Interlake Mecalux: a two-level high mezzanine in addition to the ground floor, storage for picking and a conveyor system that connects all the levels. Altogether, these solutions provide streamlined picking and are capable of organizing products of different sizes, volumes and turnovers. Founded in 1926 in the Netherlands, its French affiliate started doing business in 2008. The company supplies spare parts to the automotive sector, and acts as a go-between for the main automotive manufacturers and wholesalers in Belgium, France and the Netherlands. Its extensive catalogue includes more than 490,000 spare parts for cars, consumer goods and tools. Moreover, mechanics have 24-hour access to an online catalogue to request the parts they need from the local wholesaler. Van Heck Interpieces works with many SKUs. Consequently, it required a warehouse that offered top storage capacity (with products classified according to their size and turnover), direct access to the goods and a speedy order prep system. Taking these requirements into account, Interlake Mecalux installed a mezzanine that occupies practically the whole warehouse surface area. It is separated into two tiers, in addition to the ground-level, making full use of the available height to maximize the warehousing capacity. The warehouse was sectored, and each of the floors corresponds to a sector. The large variety of SKUs at Van Heck Interpieces is organized on each of the floors of the warehouse, to maximize picking throughput and, ultimately, the installation in general. The picking shelves on the three warehouse levels provide direct access to the goods, which simplifies storage and picking tasks. Operators must only collect the items that comprise each order directly from the shelves. The automatic conveyor circuit bridges the gap between the warehouse floors and moves the finished orders to the consolidation zone. Operators work by zones, i.e., they pick items in their assigned aisle. Interlake Mecalux built a mezzanine floor to make full use of the warehouse surface area. Each of its three levels is allocated to a type of product and has a certain number of assigned operators, which can vary depending on the demand and the quantity of orders that must be prepared. Picking is based on the “person-to-product” criterion, in other words, operators push a handcart to the locations and, once there, gather the items that correspond to each order. Likewise, it follows the order grouping system, which consists of preparing several orders during the same trip. Afterwards, these orders are verified, consolidated and sorted in a preloading zone, all meant to minimize the margin of error. The three levels are very well connected. Stairs are strategically placed so that the operators can access the corresponding level. Furthermore, there are up and over pallet gates to carry out safe pallet loading and unloading. The warehouse racks are known for their accessibility, which provides speed and precision when managing goods and picking orders. These are very versatile solutions; they include components and accessories that make it possible to store all types of products, whether they are boxes, packages, tools or spare parts. Moreover, similar products that Van Heck Interpieces stocks are classified in the same area. Aisles are wide enough to let operators move around with handcarts, picking and replenishing products. Four aisles were opened up that transversally cross the racking blocks and facilitate the movements of the operators. The rack distribution is different on each mezzanine level, to adapt to the wide variety of available products of distinct demands and turnovers. Bulky products are deposited in the racks best suited to facilitating their management. For example, exhaust pipes are placed in racks and a portion of these pieces rest on a chipboard shelf surface. Beside the mezzanine, selective pallet racks were installed with an 860 pallet capacity for product reserves. They are 23’ high and consist of five levels of electro-welded wire shelving, which guarantees greater load stability. Picking is also done directly from the pallets on lower levels. This circuit joins the three warehouse floors together automatically. It is comprised of two levels: the lower conveyor that moves prepared orders and the upper, 19’ high one, whose job is to dispense empty boxes that will be used by the operators for picking. The biggest advantage of this system is it averts interference between the two operations. The lower conveyor takes completed orders to the next floor (if an order needs more products from those housed there) or up to the consolidation zone (when the order is absolutely finished). A combination of roller and belt conveyors run along the route. The inclined belts are very useful in dealing with slopes in the warehouse. The circuit finishes off in the consolidation area. This is where packaging, labeling and the necessary dispatch documents for the order’s shipping are done up. Due to the huge number of orders put together daily, a fully automatic sealer and strapping machine are enabled. Once finished in this zone, boxes are sorted based on the order they correspond to and according to the shipping route. Efficient picking system: the warehouse was organized with product features and demands in mind, optimizing the operator’s movements and maximizing picking throughput. Accessible goods: direct access to the products is essential to speeding up order picking. Operational flexibility: the sectoring of the warehouse offers flexibility when picking orders, as each zone is assigned a number of shelves and operators, which varies according to demand.